160 acre Estancia Valley irrigated farm currently under production. Winter wheat and pinto beans were grown in 2015. There are licensed water rights on 155 acres. Farm is currently being leased to a local farmer with an annual lease payment of $7500 due December 1 of each year. 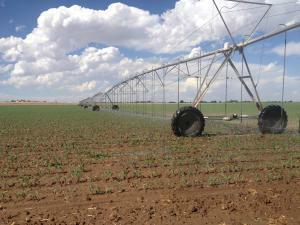 The pivot sprinkler is owned by the lessee and can be acquired for an additional fee. Lessee will remove the pivot if buyer is not interested in purchasing. Lessee is also willing to continue the lease, renegotiate the lease or vacate at the end of the growing season. This farm could be setup for drip irrigation. Come on out to the Estancia Valley where the land is fertile. Financing available through Ag New Mexico or Ag America. Listing courtesy of United Country Farm & Home Realty. © 2019 Southwest Multiple Listing Service, Inc.